If you have never tasted grilled pizza, you have no idea the heights to which pizza can ascend. While Peter Mayle is sweating over the draft of his next book about the glories of Provence, and perhaps working on those handcuffs with a small nail file, we are dining on the perfect version of nature's perfect food. Grilled pizza is one of those scary dishes to make. After all, the idea of baking over a hot charcoal fire can be a bit unnerving. Surely, one fears, the pizza will burn to a crisp, taking the glorious toppings with it into the wasteland of ash and glowing coals beneath. In practice, it is not quite that scary. After all, real coal fired pizza ovens run 600, or even 800, degrees Fahrenheit. Yes, a charcoal fire comes in around 1000 degrees or higher, but that just means your pizza is done sooner. The entire idea for this wonderful dish came from an article on grilled pizza in Cook's Magazine. We don't get Cook's anymore. They focus too much on their particular idea of perfection. Who wants to get the lumps out of their mashed potatoes? We love the lumps. Who wants lighter than air biscuits? We want condensed matter. On the other hand, their empirical approach was refreshing. As usual in their articles, they tried a variety of doughs and techniques, and it turned out that the pizza dough we had been using for years was perfect for grilling. Add the milk, olive oil, salt, 1/2 cup of water and the flour and work it into a nice dough. Cover it with a towel, set it in a warm place and let it double in size for an hour or two. According to Cook's, this dough works well because it contains olive oil, so it doesn't dry out too quickly over the hot fire, and it tastes good because the rye or whole wheat flour doesn't get washed out by the smokiness. about a cup of thinly sliced tomatoes - Costolutos are best, but make sure they are a drier variety, or dry them out so they don't get the pizza all wet. Fire up your grill. You want to make a fire that is big enough to grill one pizza, so you don't have to make a large fire. While the coals heat up, divide the dough into two (or more) chunks and roll them out on a floured surface. Bring all of your ingredients out to your grill, so you have the pizza dough, the parmesan, the tomatoes and the olive oil with garlic and basil. You will probably want to have a spatula and an extra pizza pan handy for dealing with the pizza mechanics. When the fire is as hot as it is going to get, and you cannnot bear to keep your hand over it, pick up a chunk of dough and lay it out over the fire. It will start to bake almost immediately. You will see bubbles forming. Use the spatula to peek at the hot side of the pizza. It will brown quickly, so don't be shy about peeking. If it takes a full minute, you have probably burned your pizza. When it looks brown and nicely cooked, remove it from the fire using the spatula or the pizza tray. The grill will be so hot that the pizza will not stick. We usually grill each chunk of dough on one side. Then, we close our grill to damp the fire. With the raw side down, put the toppings on each of the pizzas. Spread the surface with the olive oil, garlic, basil mix. Put down a little of the cheese. Then lay out the thin tomato slices and cover them with a bit more cheese. You don't want a thick topping. The fire is too hot do do more than melt your parmesan before it burns the crust. Now, open the grill and put each pizza in turn over the damped coals to cook the raw side. As before, be careful and don't let the crust burn. If the fire still seems awfully hot, close your grill over it. This will both dampen the flames a bit, and capture heat to melt the cheese. It is better to finish melting the cheese in a conventional oven as opposed to letting the crust char too badly, but you usually will not have to. When both sides are cooked and the cheese lightly melted, the pizzas are ready to eat. There is absolutely no pizza better than this. It combines the glories of pizza, grilled food, and fresh local ingredients to create the perfect food. UPDATE - 17 November 2007 - We just got an update from an alert reader. Those aren't consoluto tomatoes, but costoluto tomatoes. We aren't sure if they are Genovese, Fiorentino or Catanese. Unfortunately, this summer was just too cool and wet, so we had to do without our favorite tomatoes. 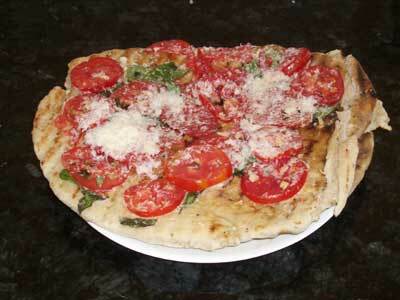 We did have grilled pizza, but we made do without the tomatoes. Why ruin a good thing?